Attention spans are not getting shorter (that's the long and short of it). Those mercurial millennials are, in fact, able to concentrate for longer than a ten second Snapchat. 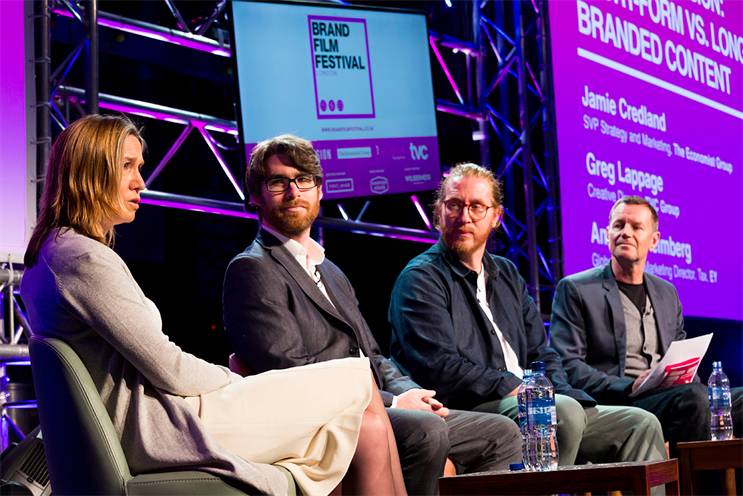 Panelists from TVC Group, The Economist Group and EY took to the stage at Campaign's Brand Film Festival to tell us why. What constitutes short- and long-form video content? It appears they mean different things to different people. To Greg Lappage, creative director at TVC Group, it’s a grey area but he says "long-form to me would be anything over a couple of minutes and short-form can be from five seconds long". 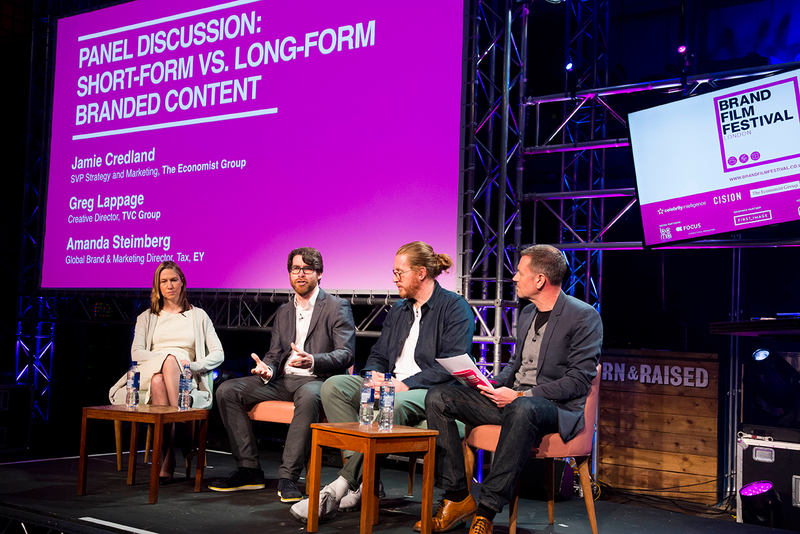 Jamie Credland, senior vice president of strategy and marketing at The Economist Group, disagreed, saying that "publishers take a different angle, with short-form being between three to five minutes and long-form being up to an hour". Do we need to keep things short in order to keep audiences engaged? Are people too busy to give anything too much of their time? Credland said no; "Look at the success of Game of Thrones, for example, that’s long content in a hugely popular ongoing series that people thoroughly engage in." After her work with The Economist Group, Amanda Steimberg, global brand and marketing director, tax at EY agrees. She said that while it’s fundamentally about knowing your audience and how they interact, long-form content has proven itself. "People want to digest long-form content, they want to be able to form opinions… they want to be able to sound smart and educated after watching something!" Lappage pointed to TVC's advert for Otis Elevator Company, explaining that they wanted to "show the liminal moments in people’s lives". It took Otis some convincing to go with the idea but ‘Made to Move You’ is now the company’s strapline after the advert took off. While lifts might not be the most exciting of products, Lappage said: "The biggest creative opportunities are sometimes in the areas where creativity is least available." Credland explained his snippet of The Economist’s long film produced for watch manufacturer Blancpain: "Blancpain wanted to make an impact and didn’t just want their logo on something meaningless. Its long association with ocean preservation was a great approach to the long film." Steimberg followed by showing a clip from EY’s ‘The Disrupters’ series which has been running for the past 18 months. She said: "When I started working I never thought you’d get away with a 30-minute film but when you use great channels I have realised you can. EY are incredibly risk adverse and very regulated which makes things complicated. But when our experts came together with The Economist, longer-form content seemed to make the most sense". Are the measures of success and ROI different for short- and long-form content? Steimberg says: "These films were principally about brand perception and changing the way we do things within EY as well as changing the way we are seen externally." The videos have views well into the millions, something that Steimberg says "has never been seen before in the history of our marketing". She also noted that Leonardo DiCaprio shared one of the films on his Instagram. Credland followed on from this, acknowledging that measurements such as likes and shares aren’t a perfect science. "We’re finding that there’s a linear relationship with the length of the film and the engagement – people are engaging more with long-form," he said. Distribution is critical to any campaign or content that you put out there. Lappage said: "Strategy, creative then distribution. Distribution is the third leg. It depends what the brief is but social, internal and external channels are all important." But is it harder to drive people to long-form? The answer is unclear, said Credland: "We are focusing more and more on YouTube. People are consuming it on TVs and large screens now. Consumption habits are ever changing and trends change too. For example, Twitter is not the ideal channel for long-form distribution but using it for short clips to drive traffic to the full-length video is useful." Steimberg mentioned EY’s marketing strategy with their long films. "We used them everywhere; internally at training, at events and across all channels. It takes a lot of planning but it was a big spend so you want to get your worth out of it." Credland said this is the beauty of long-form: "You can cut it up in a myriad of ways and use it on lots of different channels and that’s a more holistic approach." Choosing the right length of content is dependent on many variables but underestimating people’s attention spans is not the answer. "It’s about getting the right idea, executing it well and telling the story," said Lappage.